I hope everyone is making it through finals. This is a topic we discussed recently and Professor Smitka made a lot of interesting points with regards to the relationship between these two variables. I would like to tie my thoughts on this subject in with the federal budget discussions from earlier blogs. Our current deficit as a percentage of GDP is -2.3%, with spending at $3.76T and Revenues at $3.37T. Since we seem to be entering an era of periodic interest rate increases, with each such increase the budget deficit seems likely to expand. Professor Smitka does make the point that as long as loans roll over, the debt doesn’t necessarily present too bad of a problem. 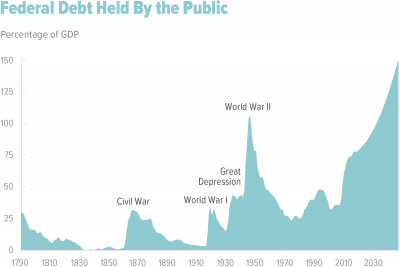 However, it seems likely that since the long-term US economic growth outlook appears sluggish compared to post-war growth, this new mountain of debt won’t be flattened out like the previous one. In fact, projections indicate that it will increase indefinitely. Is it possible that we are entering an era where indefinitely growing debt across the developed world is the norm? We can complain about it all we want, but it doesn’t seem like any GOP administration is going to cut military spending or drastically raise taxes. Considering the fact that interest rates are going up, necessitating a larger portion of the budget to go towards paying interest, and the possibility that an eventual solution to Social Security might take the form of an increased percentage of the budget, some other allocations might be cut. The EPA and Department of Education are two of the departments likely to receive funding cuts from Trump. However, there are several other areas that are possible targets as well. The annual $51.6 billion in international affairs funding comes to mind. This alone represents a sizeable chunk of the $392 billion in annual deficit. There are several other options as well, including reworking the Home Equity Conversion Mortgage Program, DOE research programs, NASA, Amtrak, Highway funding, Forest Service funding, and Pell Grants to name a few. While I’m also worried about the government’s spending, the potential cuts in government spending you propose aren’t large enough to ensure a solution. As unlikely as it is that this or any future GOP administration cuts military spending, it’s the only part that can survive major budget cuts and actually make a difference. Personally, I believe cutting things like EPA, NASA, and Pell grants don’t make sense to me because they have a direct impact on our future. NASA research has given us numerous spinoff technologies like microwaves, artificial limbs, pacemakers, and GPS. In order to remain the leaders of the world economy we need to think ahead as a country and remember that China is becoming the biggest investor in renewable energy. Being left out of the Paris climate talks and any future fights against global warming means that the U.S. is going to lag behind any future technology and innovations needed to combat climate change. The poor in this country are also already underserved by the educational system. Studies show that low income kids already have an education gap by the time they enter 1st grade and when it’s time to apply to colleges, these students take on an enormous amount of debt that takes decades to be paid off. Pell grants help these kids and give them the boost they need to actually achieve things like education that we take for granted. Looking at government spending like an investment, it makes sense to cut things that immediately depreciate in value (like things built by the military) rather than sectors that create positive returns. 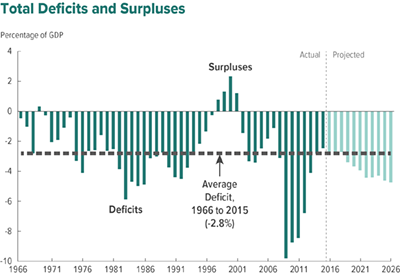 The deficit is more than $400 billion, is it not? And is there really that much fat in international affairs? Will we close our embassies in most European countries? Or cut back on intelligence expenditures? Will Congress really vote to just let national forests burn when a fire starts? And so on. These are in the budget because they meet a perceived (political) need – have those needs really changed? Whether the current array of programs makes sense from the perspective of economics-based cost-benefit analysis is a different issue.